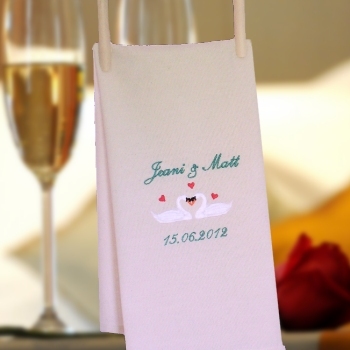 Swans in love bespoke embroidered tea towel personalised with names of your choice. This tea towel makes a gift idea for men or women on birthdays, anniversaries, Valentines Day or even Christmas! Enter the text and thread colour and font style you would like personalised.